Name Variation Josephine E. Rogers was also known as Josse. Name Variation Josephine E. Rogers was also known as Josie. Married Name 19 May 1894 As of 19 May 1894,her married name was Wery. Josephine E. Rogers was born on 30 September 1875 at Carlton, Kewaunee, Wisconsin, also reported as Sep 1874. She was the daughter of William Rogers and Mary Jane Power. Josephine E. Rogers married Vital J. Wery, son of Antoine Wery and Philipine Odile Vincent, on 19 May 1894 at Wisconsin. Josephine E. Rogers died on 14 May 1938 at West Allis, Milwaukee, Wisconsin, at age 62. Josephine E. Rogers had 3 with 2 living in 1900 children. She had 7 with 7 living in 1910 children. [S245] U.S. Federal Census 1900 U.S. Federal Census, by Ancestry.com, ED62. Dwelling 82. [S244] U.S. Federal Census 1910 U.S. Federal Census, by Ancestry.com, ED98. Dwelling 184. Name Variation Dorotha Rogers was also known as Dorothy. Dorotha Rogers was born on 15 October 1876 at Carlton, Kewaunee, Wisconsin. Robert Rogers was born on 18 January 1879 at Carlton, Kewaunee, Wisconsin. Edwin Julius Heitkamp was born on 26 February 1881 at Wisconsin. He was the son of Frederick Wilhelm Heitkamp and Marie Dorothy Schultz. Edwin Julius Heitkamp married Alma C. Liessman, daughter of Henry J. Liessman and Catherine Ohland, on 9 July 1907 at St John Lutheran Church, Reedsburg, Sauk, Wisconsin. Edwin Julius Heitkamp died on 27 March 1959 at Boise, Idaho, at age 78. In July 1925 at Lake Mills, Wisconsin, attended Liessman family reunion. [S273] Wisconsin Sauk County, Wisconsin Cemetery Records, page 108. Name Variation Fae Catherine Heitkamp was also known as Faye Catherine. Married Name Her married name was Wells. Fae Catherine Heitkamp was born on 26 February 1914 at Illinois. She was the daughter of Edwin Julius Heitkamp and Alma C. Liessman. Fae Catherine Heitkamp died on 24 March 1988 at age 74. In July 1925 at Lake Mills, Wisconsin, attended Liessman family reunion. Fae Catherine Heitkamp graduated in 1931 at Reedsburg High School, Reedsburg, Sauk, Wisconsin. Name Variation Marie Dorothy Schultz was also known as Mary. Married Name 7 February 1878 As of 7 February 1878,her married name was Heitkamp. Marie Dorothy Schultz was born on 26 July 1859 at Hanover, Germany. She married Frederick Wilhelm Heitkamp, son of Anton Friedrich Wilhelm Heitkamp and Marie Luise Uphoff, on 7 February 1878 at Madison, Dane, Wisconsin. Marie Dorothy Schultz died on 2 December 1927 at age 68. [S246] U.S. Federal Census 1880 U.S. Federal Census, by Ancestry.com, NA Film Number T9-1421 Page Number 128D. Name Variation Frederick Wilhelm Heitkamp was also known as Friederich. Name Variation Frederick Wilhelm Heitkamp was also known as Carl Friedrich Wilhelm. Name Variation Frederick Wilhelm Heitkamp was also known as Fritz. Name Variation Frederick Wilhelm Heitkamp was also known as Fred. Frederick Wilhelm Heitkamp was born on 5 April 1851 at Prussia, Germany. He was the son of Anton Friedrich Wilhelm Heitkamp and Marie Luise Uphoff. Frederick Wilhelm Heitkamp married Marie Dorothy Schultz on 7 February 1878 at Madison, Dane, Wisconsin. Frederick Wilhelm Heitkamp died on 7 December 1932 at age 81. Married Name Her married name was Toeder. Name Variation Alvina Heitkamp was also known as Lenna. Alvina Heitkamp married Albert Toeder. Alvina Heitkamp was born in 1879 at Wisconsin. She was the daughter of Frederick Wilhelm Heitkamp and Marie Dorothy Schultz. Alvina Heitkamp died on 15 October 1941. Albert F. Niebuhr was born circa 1880 at Wisconsin. He married Antonia Liessman, daughter of Henry J. Liessman and Catherine Ohland, before 1904. Albert F. Niebuhr married Ella Hoefs on 12 December 1906 at second marriage for him; St John Lutheran Church, Reedsburg, Sauk, Wisconsin. [S244] U.S. Federal Census 1910 U.S. Federal Census, by Ancestry.com, Year: 1910; Census Place: Reedsburg Ward 2, Sauk, Wisconsin; Roll: T624_1736; Page: 13A; Enumeration District: 0124; FHL microfilm: 1375749. Married Name circa 1865 As of circa 1865,her married name was Ohland. Mary S. (?) was born circa 1839 at Hanover, Germany. She married George Ohland, son of (?) Ohland, circa 1865. Mary S. (?) died after April 1910. Mary S. (?) and George Ohland immigrated in 1867. Mary S. (?) had 5 with 3 living in 1910 children. [S246] U.S. Federal Census 1880 U.S. Federal Census, by Ancestry.com, NA Film Number T9-1446 Page Number 266B. [S244] U.S. Federal Census 1910 U.S. Federal Census, by Ancestry.com, ED130. Dwelling 120. Stamp 66. Name Variation George Ohland was also known as Juergen. George Ohland was born circa 1841 at Hanover, Germany. He was the son of (?) Ohland. George Ohland married Mary S. (?) circa 1865. George Ohland died after 1910. George Ohland and Mary S. (?) immigrated in 1867. George Ohland lived in 1910 at Sauk, Wisconsin. August Ohland was born on 11 October 1881 at Wisconsin. He was the son of George Ohland and Mary S. (?). He died in April 1968 at age 86. August Ohland obtained US Social Security Card at Wisconsin; last residence Reedsburg, Sauk, Wisconsin. [S354] Wisconsin, Saint Paul Lutheran Cemetery - Washington, Sauk, WI. Name Variation Verlynne Emerson Parish was also known as Vern. Verlynne Emerson Parish was buried at Terrace Heights Memorial Park, Yakima, Yakima, Washington. He was born on 8 January 1910 at Academy, South Dakota. He was the son of Hugh Alvin Parish and Myrtle Alana Nokes. Verlynne Emerson Parish was living in December 2006. [S243] U.S. Federal Census 1920 U.S. Federal Census, by Ancestry.com, ED46. Dwelling 11. [S250] U.S. Federal Census 1930 U.S. Federal Census, by Ancestry.com, ED17. Dwelling 18. Lawrence A. Mugaas was born circa 1908 at Washington. He was the son of Knute Mugaas and Dora B. (?). Lawrence A. Mugaas married Mildred M. Paddock, daughter of Frank Shultz Paddock and Marie Josephine Carlson, on 11 August 1934. [S244] U.S. Federal Census 1910 U.S. Federal Census, by Ancestry.com, ED291. Dwelling 193. [S243] U.S. Federal Census 1920 U.S. Federal Census, by Ancestry.com, ED185. Dwelling 201. Ralph George was born on 4 January 1914 at Charles Mix, South Dakota. 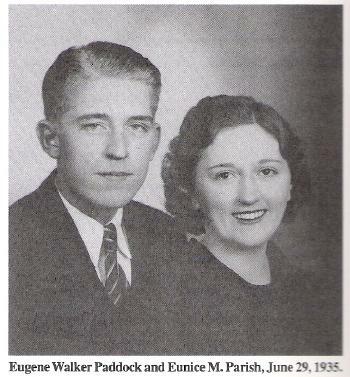 He married Mildred M. Paddock, daughter of Frank Shultz Paddock and Marie Josephine Carlson, on 2 July 1941. Ralph George died on 29 January 1969 at Yakima, Washington, at age 55. Married Name 21 January 1956 As of 21 January 1956,her married name was Palm. Joan Marie Mugaas was born on 26 November 1935 at Yakima, Washington. She was the daughter of Lawrence A. Mugaas and Mildred M. Paddock. Joan Marie Mugaas died on 12 September 1996 at Washington at age 60. Name Variation Eunice Merle Parish was also known as Merrill Eunice. Name Variation Eunice Merle Parish was also known as Merle Eunice. Married Name 29 June 1935 As of 29 June 1935,her married name was Paddock. Married Name after 1954 As of after 1954,her married name was Collins. Name Variation after 1954 As of after 1954, Eunice Merle Parish was also known as Paddock-Collins. Eunice Merle Parish was born on 17 July 1914 at Academy, South Dakota. She was the daughter of Alton Raymond Parish and Jessie M. Smith. Eunice Merle Parish married Eugene Walker Paddock, son of Frank Shultz Paddock and Marie Josephine Carlson, on 29 June 1935 at Yakima, Washington. Eunice Merle Parish-Paddock Collins, age 92, of Selah died September 27, 2006. She was born July 17, 1914 in Academy, South Dakota to parents, Alton and Jessie (Smith) Parish. Merle retired at age 75 working with Matson Fruit for many years. She was an avid gardener and enjoyed camping and fishing. She gave much of her time to help others in need. She is preceded in death by her parents, two daughters, Arletta Schoch and Louetta Carlile; a sister and a brother. Merle is survived by a son and daughter in law, Lynn and Debra Paddock, of Selah; a daughter and son in law, Brenda and Robert Jump, of Moses Lake, WA; sister, Lucia Qualm, of Platte, South Dakota; sister in law, Evelyn Parish of Platte, SD; 13 grandchildren; 13 great grandchildren; four great great grandchildren and numerous nieces and nephews. Funeral Services will be at 2:00 PM Monday October 2, 2006 at Keith and Keith Funeral Home on Ninth and Yakima Avenue. Interment to follow at West Hills Memorial Park. Visitation will be Saturday and Sunday from noon to 5PM at the funeral home. She was buried after 27 September 2006 at West Hills Memorial Park, Yakima, Yakima, Washington. [S243] U.S. Federal Census 1920 U.S. Federal Census, by Ancestry.com, ED46. Dwelling 28. Married Name Her married name was Schoch. Name Variation Arletta Merle Paddock was also known as Letty. Arletta Merle Paddock was born on 25 June 1937 at Yakima, Washington. She was the daughter of Eugene Walker Paddock and Eunice Merle Parish. Arletta Merle Paddock died on 9 October 2003 at Olympia, Washington, at age 66. Married Name Her married name was Carlile. Louetta Verle Paddock was born on 27 August 1938 at Yakima, Washington. Louetta Verle Paddock died on 22 May 1985 at Oakville, Washington, at age 46. Married Name 18 May 1945 As of 18 May 1945,her married name was Carlson. Doris Marilyn Hagen was born on 16 April 1926 at Hawarden, Iowa. She was the daughter of Carl Hagen and Nettie Asper. Doris Marilyn Hagen died on 27 June 2012 at age 86 Doris Marilyn Carlson was born to parents Carl and Nettie (Asper) Hagen on April 16, 1926 in Hawarden, IA, the youngest of eleven children. She died June 27, 2012 at Mercy Medical Center in Sioux City, IA at the age of 86 years, 2 months and 11 days. Doris was baptized and confirmed in the Lutheran faith. She was a member of Nathanael Lutheran Church and Ruth Circle. Doris attended Cole Rural School, Alcester High School, and graduated from Augustana Academy, Canton, SD, 1944. She went to secretarial school and worked for a short time in Sioux City, IA. Doris was united in marriage to Kenneth Carlson on May 18, 1945. They farmed in the Alcester area from 1947 to 1990. She worked in a grocery store in Alcester for 25 years. Together they enjoyed 25 years of square dancing. They also loved to travel, wintering in Texas and took many fishing and camping trips with the family and friends. Making lefse and flat bread together was a “must” for the winter months. She enjoyed embroidery work and quilting at church. She was also the unofficial Alcester and family historian compiling over 70 scrapbooks of family and friends, including pictures and events. She will be remembered as a kind, gentle, proper lady who loved her family, with a special place in her heart for babies and young children. Those grateful for having shared her life are her husband Kenneth; two sons, David and wife Sandy of Alcester and James of Morrison, CO; three daughters, Linda Hinkley and husband Lee of Forest City, IA, Linette Trudeau and Julie Montgomery and husband Steve all of Sioux Falls; 10 grandchildren, Chris and wife Angel, Alliance, NE, Tad Hinkley, Fort Collins, CO, Andrew Hinkley, Minneapolis, MN, Shane and wife Maggie Carlson, Minneapolis, MN, Shannon and husband Dennis Motl, Robbinsdale, MN, Matt and wife Rachelle Carlson, Justin and wife Renae Trudeau, Jordan Trudeau, Jody and husband Aaron Addland, all of Sioux falls, and Stephanie and husband Rob Meier, Tea, SD; fourteen grandchildren; three sisters-in-law, Bonnie Hagen, Ruby Carlson and Rosanna VanNoort; and a host of nieces, nephews, relatives and friends. She was preceded in death by her parents, infant daughter Bonnie, brothers, Arlo, Noble, Norman, Lawrence, Carlyle, and Olaf, and four sisters, Lillian, Elsa, Mabelle and Opal. Funeral services will be held 2:00 PM, Saturday, June 30, 2012 at Nathanael Lutheran Church in Alcester with burial to follow at Pleasant Hill Cemetery. Visitation will be Friday at the church from 6PM to 8PM with a prayer service at 7PM. Married Name Her married name was Carlson. Valerie (?) married Marvin Gustaf Carlson, son of John Verner Carlson and Tilda Oakland. Valerie (?) died on 6 March 1983. Name Variation Steven W. Schrank was also known as Steven C.
Steven W. Schrank was born on 30 January 1953 also reported as 27 Nov 1953. He was the son of Ernest August Henry Schrank and Loretta Louise Anna Marie Schaefer. Steven W. Schrank died on 21 October 2011 at Madison, Dane, Wisconsin, at age 58 STEVEN W. SCHRANK, age 58 of Rock Springs died on Friday, October 21, 2011 in the University Hospital in Madison. He was born on January 30, 1953 in Reedsburg, WI the son of Ernest and Loretta (Schaefer) Schrank. Steve worked at Grede Foundries Inc. in Reedsburg for 37 years. He loved sports of all kinds, but especially hunting, fishing, trap shooting and bowling on the St. John’s League at Baraboo. His faith was very important to him and he was very active in his church having taught Sunday School and being the Superintendent for many years. Helping as church custodian for several years and also with his father for 18-20 years. He had been a volunteer with the Rock Springs Fire Dept. for many years. His parents preceded him in death. His Aunts, cousins and many friends. We honor his life with a funeral service on Saturday, October 29, 2011 at 11:00 A.M. in St. John Ev. Lutheran Church, Rock Springs with Pastor David Karow officiating. Burial will be made in St. John Cemetery, Rock Springs. Visitation will be on Friday from 4-8 P.M. at the Farber Funeral Home and again on Saturday at the church from 10 A.M. until the time of service. Memorials of remembrance may be made to St. John Lutheran Church, Rock Springs in lieu of flowers. Ole Colberg was born on 17 June 1903 at Toronto, South Dakota. He was the son of August Colberg and Antonette Olson. Ole Colberg died on 10 July 1989 at Estelline, South Dakota, at age 86. Leslie Colberg was born on 1 January 1929 at Toronto, South Dakota. She was the daughter of Ole Colberg and Hazel Marie Millage. Leslie Colberg died in April 2003 at age 74. Joyce Colberg was born on 21 November 1929 at Toronto, South Dakota. Joyce Colberg died on 19 October 1999 at Sioux Falls, South Dakota, at age 69. Wallace Colberg was born on 11 July 1933 at Toronto, South Dakota. He was the son of Ole Colberg and Hazel Marie Millage. Wallace Colberg died on 8 February 1981 at Estelline, South Dakota, at age 47. Severt Oscar Johanneson was born on 18 June 1895 at Freeman, South Dakota. He was the son of Anders Johanneson and Helena Colberg. Severt Oscar Johanneson married Viola A. Millage, daughter of Virgil Millage and Hulda Alverda Carlson, on 5 September 1928 at Chamberlain, South Dakota. Severt Oscar Johanneson died on 30 September 1981 at Lake Andes, South Dakota, at age 86. He was buried in October 1981 at Lake Andes, South Dakota. On 5 June 1917 at World War I Draft Registration, Charles Mix, South Dakota. [S250] U.S. Federal Census 1930 U.S. Federal Census, by Ancestry.com, ED9. Dwelling 97. Married Name November 1963 As of November 1963,her married name was Rose. Agnes L. Johanneson was born on 26 December 1929 at Lake Andes, South Dakota. She was the daughter of Severt Oscar Johanneson and Viola A. Millage. Agnes L. Johanneson died on 8 May 1997 at Lake Andes, South Dakota, at age 67. Severt Arthur Johanneson was born on 29 January 1933 at Lake Andes, South Dakota. He was the son of Severt Oscar Johanneson and Viola A. Millage. Severt Arthur Johanneson died on 12 March 1973 at Yankton, South Dakota, at age 40. Albert Lee Johanneson was born on 15 December 1938 at Geddes, South Dakota. Albert Lee Johanneson died on 7 April 2003 at age 64 Albert Lee Johanneson, 64, Vermillion, died Monday (April 7, 2003) at Sioux Valley Vermillion Hospital. Funeral service is 10:30 a.m. Saturday at the First Lutheran Church, Lake Andes. Burial follows in the Lakeview Cemetery, Lake Andes. Visitation is from 6-8 p.m. Friday at the Koehn Brothers Funeral Home, Lake Andes. He was born Dec. 15, 1938, at Lake Andes to Severt and Viola (Millage) Johanneson. He attended Goose Lake 21 Country School, rural Lake Andes. He farmed on the family farm near Lake Andes with his brothers. He moved to Yankton for a number of years and then moved to Vermillion. He is survived by two brothers: Ray Johanneson and James Johanneson, both of Lake Andes; and three sisters: Alice Johanneson, Wagner; Violet Johanneson, Mitchell; and Alma Miller, Houston, Minn. He was preceded in death by his parents, three brothers and two sisters.